TNFUSRC Forester Exam is a Computer-based Online Examination will be conducted from 06.12.2018 to 09.12.2018. TNFUSRC Forest Guard and Forest Guard with driving licence also Computer-based Online Examination will be conducted on 10.12.2018 and 11.12.2018. Students looking for Model question papers for TNFUSRC Forester & Forest Guard with the licence is given below. We upload question papers with answer key and also questions in both English and Tamil. 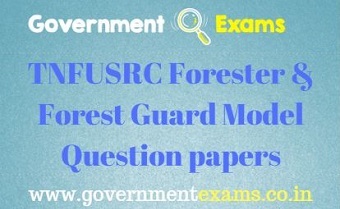 Download question papers in PDF format and workout before appearing Forester and Guard exam. Check the Revised exam date and schedule by clicking the Link – Forester & Forest Guard Revised Exam Date.